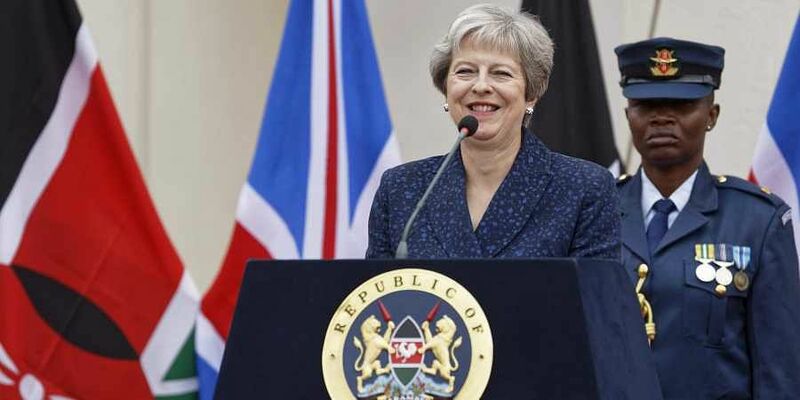 British Prime Minister Theresa May held talks with Kenya's President Uhuru Kenyatta in Nairobi on Thursday, promising post-Brexit trade continuity on the final leg of her three-nation tour of Africa. Mrs May's three-day trip to Africa, which began in South Africa on Tuesday, is aimed at deepen economic and trade ties with growing African economies ahead of Britain leaving the European Union in 2019. I am proud to be leading this ambitious trip to Africa and to become the first UK Prime Minister in over 30 years to visit Kenya, May said regarding the visit. British Prime Minister Theresa May wrapped up a three-country tour of Africa with a visit Thursday to Kenya. The President observed that even though Kenya and Britain enjoy a strong relationship, there is need to strengthen the bond further by setting up a working group to lead discussions with a view of coming up with a clearer and stronger framework for cooperation between the two countries. "But we will be looking to enhance our trade relationships around the rest of the world as well". This her first visit to the continent since she took the reins from David Cameron in 2016. "We wish to prosper together so let us do business together". "As Britain prepares to leave the European Union we are committed to smooth transition and continuity in our trading relationship". But she has shrugged off the mockery and joined in the fun again - adding a new poking swimming motion to her moves. "Already British terrorists and child abusers are in United Kingdom jails because of our cooperation", she said. Britain is Kenya's largest trading partner and a major market for its exports of cut flowers. In the past two years two British men have been sentenced to long prison sentences after travelling to the African country to sexually abuse youngsters, some of whom were destitute street children. Speaking at Kenya-UK business forum at Strathmore University in Nairobi, May said the entry of the 20 companies in Kenya was a clear demonstration of the confidence the British investors have in Kenya's investment environment. She also announced that the British government would invest $NZ7.8 billion in African economies, without giving details.